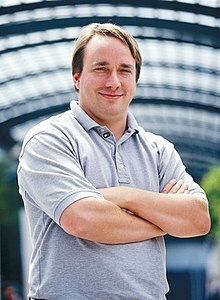 Linus Benedict Torvalds (/ˈlaɪnəsˈtɔːrvɔːldz/; Swadish: [ˈliːn.ɵs ˈtuːr.valds] ( listen); born December 28, 1969) is a Finnish-American saftware ingineer wha is the creator an, for a lang time, principal developer, o the Linux kernel; which acame the kernel for operatin seestems such as the Linux operatin seestem, Android, an Chrome OS. He an aa creatit the distributit reveesion control seestem Git an the divin loggin an planning saftware Subsurface. He wis honoured, alang wi Shinya Yamanaka, wi the 2012 Millennium Technology Prize bi the Technology Academy Finland "in recogneetion o his creation o a new open soorce operatin seestem for computers leadin tae the widely uised Linux kernel". He is an aa the recipient o the 2014 IEEE Computer Society Computer Pioneer Awaird. ↑ Rogoway, Mike (June 7, 2005). "Linus Torvalds, Incognito Inventor". The Oregonian. Archived frae the oreeginal on 2009-05-23. Retrieved July 8, 2014. A sort of anti-celebrity, he is plainly ambivalent about fame and content to stay nestled at home in a tony cluster of million-dollar houses atop the densely forested hills of the Dunthorpe neighborhood. ↑ 2.0 2.1 "Citizen Linus". LWN.net. September 13, 2010. ↑ "Linux Online – Linus Torvalds Bio". Linux.org. Archived frae the oreeginal on June 26, 2004. Retrieved March 13, 2010. ↑ Rogoway, Mike (September 14, 2010). "Linus Torvalds, already an Oregonian, now a U.S. citizen". The Oregonian. Retrieved September 16, 2010. ↑ "Technology Academy Finland – Stem cell pioneer and open source software engineer are 2012 Millennium Technology Prize laureates". Technologyacademy.fi. April 19, 2012. Archived frae the oreeginal on January 17, 2014. Retrieved April 24, 2012. This page wis last eeditit on 27 Mairch 2017, at 18:57.